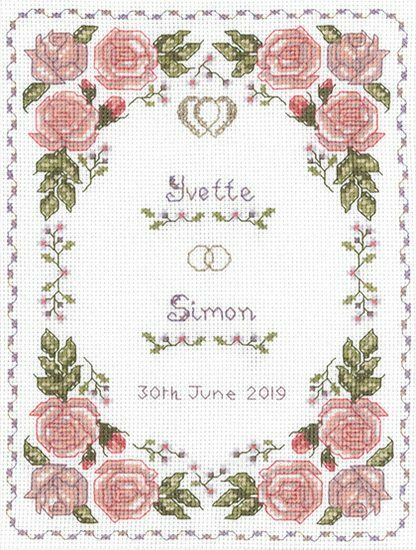 A Roses Dusky Pink Wedding Sampler with a lush border of roses with sparkling amethyst thread. 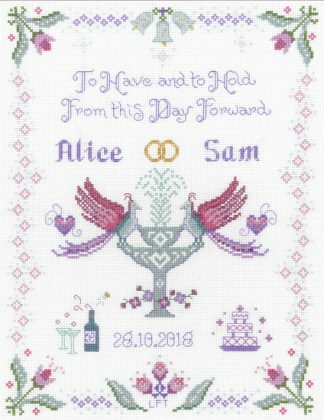 A Roses Dusky Pink Wedding Sampler with a luscious border of roses and sparkling amethyst thread. Dusky pinks are current for the wedding forecast colours; they have been combined with soft mauves and contrasting olive green. Highlights are added by the use of golden metallic thread for the hearts & rings. and so you can stitch away with no delay ! 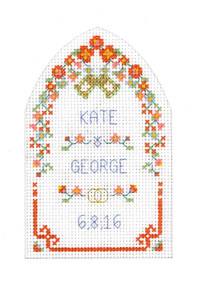 This Roses Dusky Pink Wedding Sampler is designed by Lauren Turner for the Decorative Textiles collection. 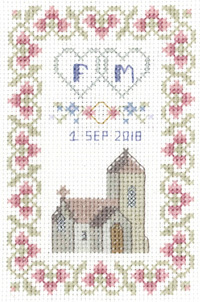 The combined range has a wide choice of anniversary cross stitch cards and samplers.